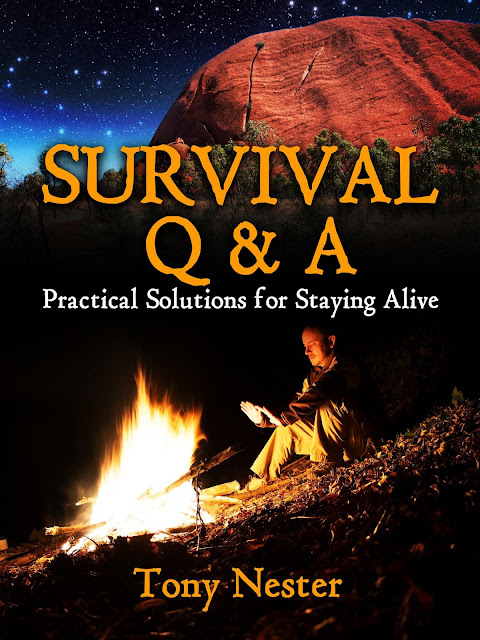 Ancient Pathways Survival School, LLC: Newly updated book, Survival Q & A is now available. Survival Q & A is a second edition with a newly updated cover. Can you really get water in the desert from a solar still? Should you ever attempt to suture a wound, Rambo style, in the backcountry? What is the best treatment for a rattlesnake bite? How do you distinguish cougar tracks from dog tracks? Should you drink from your swimming pool during an urban disaster? How do you survive a night in the snow without any gear? These are just a few of the many questions survival instructor Tony Nester answers in his informative, and at times, humorous book. Culled from the past twenty-five years of teaching, writing, and responding to readers of his popular Practical Survival book series, Tony delves into the Q & A of survival as it relates to forest, desert, jungle, and urban settings along with the often misunderstood realm of living off the land. About the Author: Tony Nester is the author of numerous books and DVDs on survival. His school Ancient Pathways is the primary provider of survival training for the Military Special Operations community and he has served as a consultant for the NTSB, FAA, Travel Channel, NY Times, Backpacker Magazine, and the film Into the Wild. For years he wrote a popular monthly column for Outside Magazine and his freelance writing is frequently featured in numerous print publications. This is a digital-format book and it is available on Kindle, Nook, Kobo, Apple iBooks, Google, and more. Amazon orders can be purchased by clicking here or on the photo above. Cost is 0.99 for a limited time.